It has always been a dream of ours to travel to Tuscany…or Alsace…or Napa…. Until then, we will make do with our Arkansas wine odysseys. Every year we travel to Hot Springs for the Arkansas Derby and a bit of relaxation. (See my last post.) 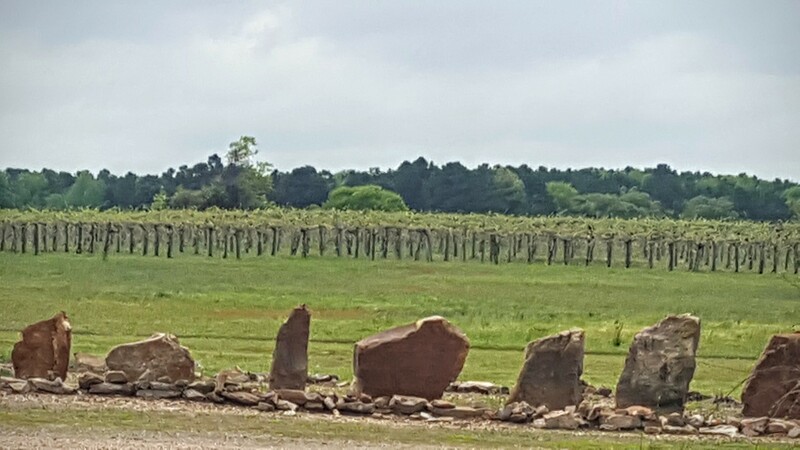 On our trip home, we always stop in Altus and at least one winery. Chateau Aux Arc has been a favorite for many years. 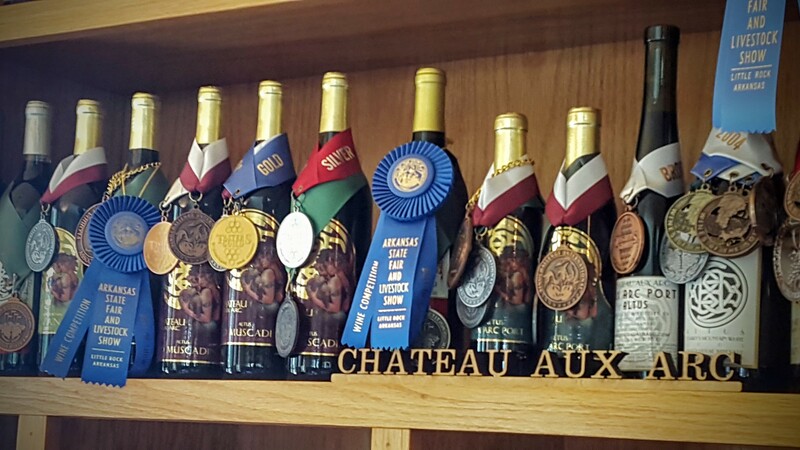 We have bought numerous cases of wine there as well as Cynthiana grape vines for our own mini-vineyard. In 2012, I posted about a visit and a kind soul commented about Mount Bethel Winery. I have wanted to visit ever since. We made Mount Bethel our first stop. 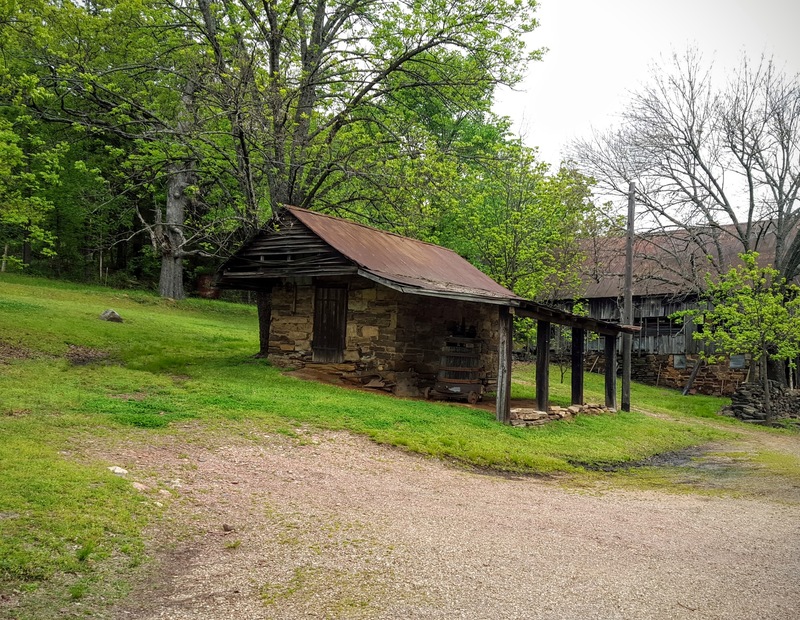 As the long ago comment mentioned, “It is not a showy place.” But, it is a family run business with deep roots and lots of charm. We pulled in on a Sunday morning around 11:45. (The website stated the tasting room opened at noon.) The door was opened so we sauntered on in. Behind the cash register sat a lovely older women, the matriarch of the family, who welcomed us warmly while chiding that we had caught her in her apron. I laughed along with her and told her we could wait outside but she said she would be more than happy to help us until “the girls” showed up. 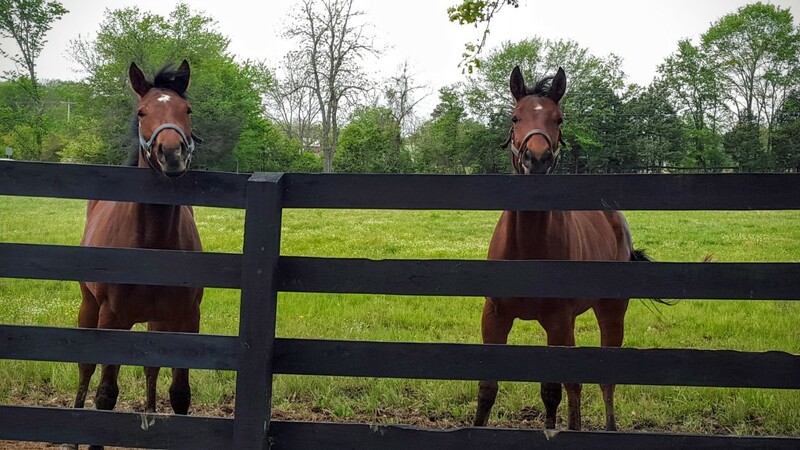 When she found out we were returning from the races, she let us know that they had raced horses on Thursday and Friday of that week and had done pretty well. We were intrigued by her stories. She said the winners had probably greeted us on the way in. 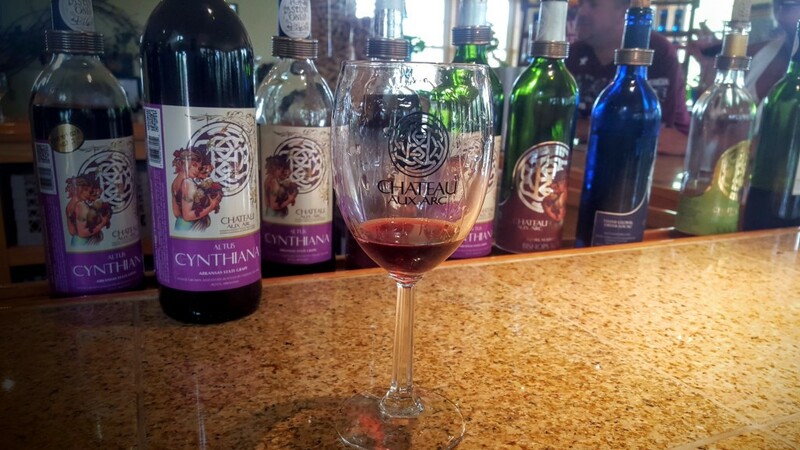 We sipped four wines but ended up purchasing their Cynthiana, their Cabernet Sauvignon, and their Chardonnay. One of “the girls” arrived and told us more horse racing stories. Some more charm at Mount Bethel Winery. The tasting room here has an authentic European feel as you step down into a cellar-like room. It is small and cozy with native rock walls and definitely feels subterranean. 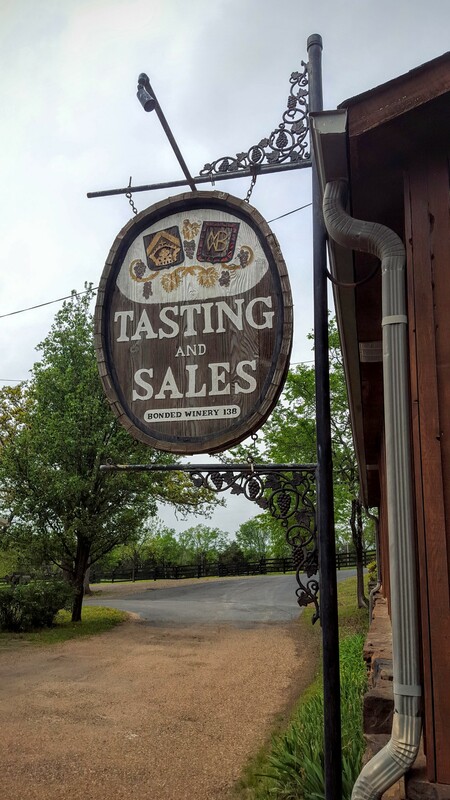 We will certainly add this winery to our yearly traditional trip. Next we revisited Chateau Aux Arc. I really do like this place. We bellied up to the tasting room bar and were treated to the full tasting (minus some of their sweeter stuff—we just don’t have the palate for that). We were soon joined by a girls-gone-wine group that were intent on visiting all the wineries in the area. Soon a couple joined us. Pouring and describing the wines kept our host hopping. She did a good job. Sadly though, there were no Cynthiana vines to be had this year. On our way back to I-40, we spotted a new winery that had a small tasting room in a portable building: Dionysus Wine. We could have made a U-turn but we were hungry and probably had tasted quite enough wine at this point. We will have to make this a stop on our next trip. 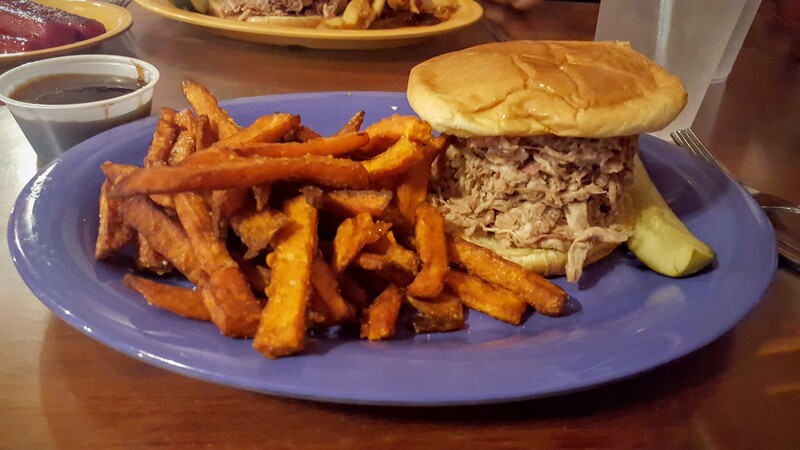 We headed to Ozark for some good old fashioned barbecue at Rivertowne BBQ. We had visited here once before and remembered their ‘que as being quite tasty. 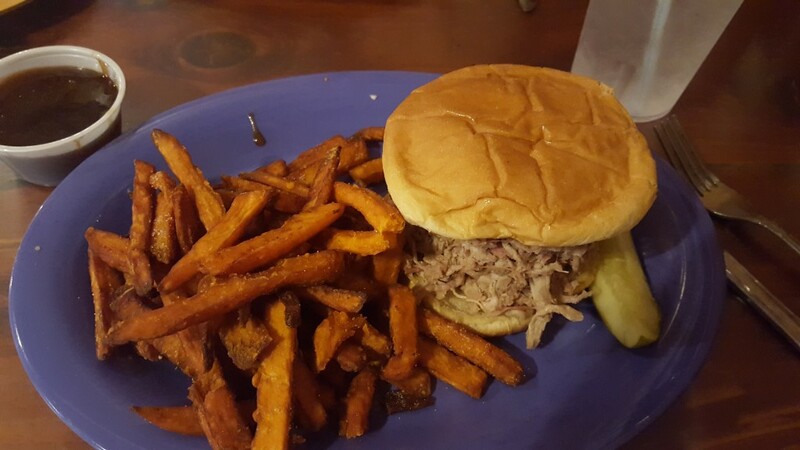 Pulled pork sandwich with sweet potato fries. I love their sweet potatoes fries. The fries are served with a super sweet molasses-like dipping sauce. Again, I don’t go in for that sweet of stuff but it does seem to be a favorite and a specialty of the restaurant. This is a small sandwich. I bet it was at least three inches high. If you are ever in the area, I highly suggest you take the windy road from I-40 to Altus and enjoy the drive and the sips. Thanks, Liz. It is a lovely place. It seems wineries are popping up all over our country. There is even a winery not too far from our home here in Florida. I would have thought it was way too hot and humid here. It sounds like you had a nice trip and boy that pork sandwich looked good. Wineries are magical places! there is something of a mystery in them that I love! They really are magical places. I think because the vintners are so passionate about their careers. We haven’t really gotten into visiting wineries, which is odd considering how much of it we drink! This sounds like a lovely destination. We’d be tempted to buy a case too. Or is that two? 🙂 Fun post — thanks. Really fun and low key area. Not frou-frou, but very down to earth.